large number of Congress worker who are supporting Tuki Government in Arunachal Pardesh protesting near Rajbhawan in Itanagar against the Guwahati High court judgement. they blocked the main road approaching Raj Bhawan and burn tyres to disrupt the traffic movement. 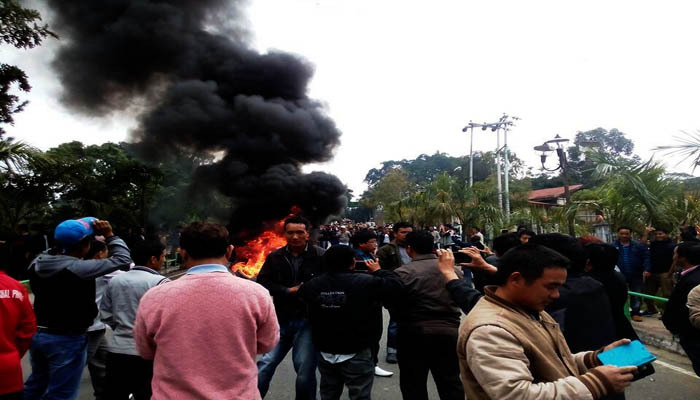 The Gauhati High Court on Wednesday vacated an interim order that kept in abeyance the Arunachal’s assembly session summoned by governor JP Rajkhowa from December 16-18 last year. But members of the Tuki camp said the fate of the state government depends on the Supreme Court, which is scheduled to hear its appeal for maintaining status quo in Thursday. The Congress dissidents, numbering 21 and led by former finance minister Kalikho Pul, have the support of 11 BJP and two independent legislators. “The single judge bench of Justice BK Sarma dismissed the interim order passed in (Arunachal Pradesh speaker) Nabam Rebia’s favour on December 17 last year,” SS Dey, lawyer for deputy speaker TN Thongdok, said. Thongdok, one of the dissidents, had headed the controversial Assembly session that Honbl Governor J P Rajkhowa advanced from January 14-16. Rebia was “impeached” and Tuki lost a “floor test” in the assembly. Rebia, who had issued a notice ahead of that assembly session disqualifying 14 MLAs, approached the HC on December 17 and obtained an order keeping the session in abeyance before Thongdok challenged it. Legal advisors of the dissidents said the no-confidence motion against Tuki and the selection of Pul as the new chief minister stands valid after Wednesday’s court ruling.